^ C. K. Seyfert. Nuclear Emission in Spiral Nebulae. Astrophysical Journal. 1943, 97: 28–40. Bibcode:1943ApJ....97...28S. doi:10.1086/144488. ^ L. S. Sparke, J. S. Gallagher III. 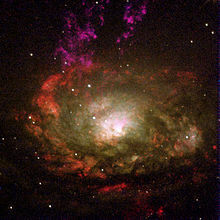 Galaxies in the Universe: An Introduction. Cambridge: Cambridge University Press. 2007. ISBN 0-521-67186-6 请检查|isbn=值 (帮助). ^ Osterbrock, Donald E. and Ferland, Gary J. Astrophysics of Gaseous Nebulae and Active Galactic Nuclei 2nd. University Science Books. 2006: 390. ISBN 1-891389-34-3. ^ Haardt, F., & Maraschi, L. A two-phase model for the X-ray emission from Seyfert galaxies. Astrophysical Journal. 1991, 380: L51–L54. Bibcode:1991ApJ...380L..51H. doi:10.1086/186171.